Nothing burns more than standing outside in low-to-negative-degree temperatures and having unforgiving winds smack you in the face. But anyone who loves sports and lives in a cold weather city can agree that the NBA’s and NFL’s of the world, powered by TV broadcasts and social media, help ease our way through the late fall and winter when these conditions prevail. It’s understandable why some of these freezing cold games are blacked out from being aired because there are unsold tickets due to intense weather. Inversely, it’s hard to fathom why fans are willing to risk unconsciously blacking out from standing in life-threatening, frigid weather, donning cheese hats, dogs masks, waving yellow towels, or being half-naked with team-colored body paint to show their loyalty to their favorite squad. But witnessing epic battles between 22 guys who are willing to put their girth, talents, and lives on the line, literally, in polar vortex conditions, just to get that Lombardi Trophy, is what makes us love being in the thick of the winter months. 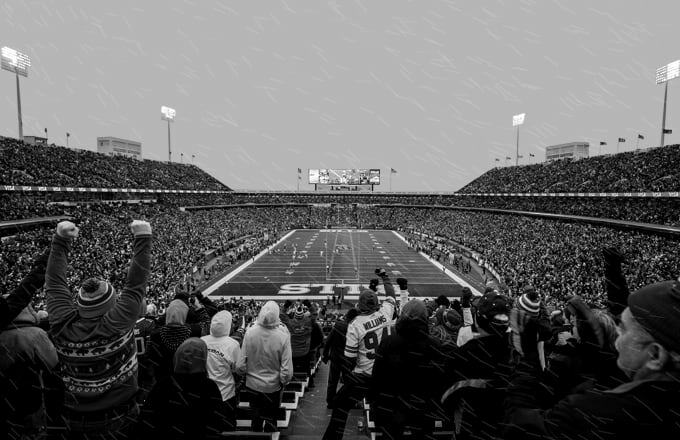 Check out our top picks for The Coldest NFL Games in History.